What do you think of a program that bears the name of AVASoft Professional Antivirus? You probably believe this application will professionally protect your computer from malware exposure? Do you think it will warn you ahead of time about threat intrusion attempts? Or maybe you consider it to be an innovative security program that is worth installing? If you really think so then you’re wrong. 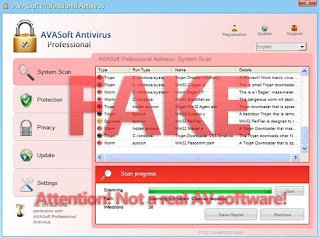 AVA Soft Professional Antivirus is a fake anti-spyware program that is designed by hackers for the only goal of scaring users with fake virus reports and prompting them into buying the so-called licensed version of it. The very fact of infiltration of this scam onto your computer is a sign of poor level of security protection of your system, a proof of weakness of available antivirus that is already installed on your computer. If this is not so, then why did the security software installed on your machine allow this hoax to come into your system initially? This is surely a good question to consider, and it must be put to the world’s security software giants. Regretfully, the appearance of AVASoft Antivirus Professional scam on many computers these days is another proof of the fact that there’s no 100% security protection that could be rendered by security companies these days. 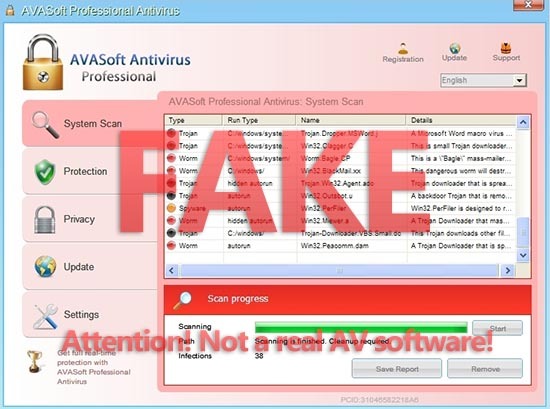 Speaking of AVASoft Professional Antivirus, we see the evidences that this application is the direct successor of Disk Antivirus Professional scam. It enters computers illegally, without user’s participation or even knowledge about the installation procedure taking place. Plus, while the installation is going on, the rogue modifies your system parameters with the intention of appearing each time user turns the computer on. The hoax is launched automatically once the system is booted. It starts its fake scanning of your machine and, upon termination, reports the list of fake threats and all sorts of infections. All of them are invented and not really residing on your hard drive. In addition, while the rogue runs itself on the computer, it displays the wide list of fake security alerts, warnings and notifications. Their examples are given below. Application cannot be executed. The file cmd.exe infected. Attention! System detected a potential hazard (TrojanSPM/LX) on your computer that may infect executable files. Your private information and PC safety is at risk. To get rid of unwanted spyware and keep your computer safe your need to update your current security software. Some critical system files of your computer were modified by malicious program. It may cause system instability and data loss. You must not trust any portion of the information reported by AVA Soft Antivirus. The reason why it gives such untrue statements in front of you is because it wants you to buy its license (activation key). But this will not protect you from real infections that are being massively spread these days. This scam, by the say, has its own site www.tech-ava-soft.org that represents the rogue security program. It is dangerous, because it contains the direct link to the fraudulent payment processing page of this scam. You may see how this site looks like below. The problem for many users when dealing with AVASoft Professional Antivirus is inability to stop its process that is running. The rogue blocks launching of many security applications that you already have installed on your system. However, what’s the point of them if they didn’t protect you from this hoax initially? This is a good observation, for sure. You might want to download some other security program to remove AVASoft Antivirus. Yet, you will also have a problem doing so. The rogue will tell that the file you attempt to download or execute is infected with some serious malware. The same thing happens when you open your browser (whatever one you have) or even Task Manager that could potentially terminate the process of AVASoft Professional Antivirus scam. Removal of AVASoft Professional Antivirus is described below. You need to use the command called “taskkill.exe” that will help you stop this malware from running on your system. Then you may run any security program of your choice that will help you eliminate this rogue from your system. An alternative trick is to active AVASoft Antivirus using this code - AA39754E-715219CE. The malware after activation isn’t yet removed. It’s time to do the cleanup procedure with the help of legitimate security application. We recommend you to try GridinSoft Trojan Killer for this purpose. 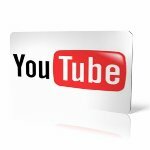 Terminating (stopping) the malicious process of fake AV. Running security software (anti-virus) to delete all remnants associated with this scam. 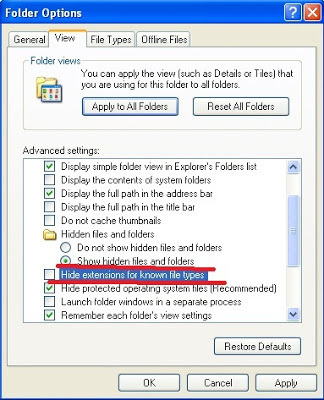 Enable the display of extensions. Run Explorer by clicking Win+E. Copy two files --> cmd.exe and taskkill.exe and transfer them to your desktop. Rename those files on the desktop --> cmd.exe into explorer.exe and taskkill.exe into iexplore.exe. Run from the desktop renamed file cmd.exe (now explorer.exe).